You are here: Home / People / What’s in a name? Quinn St, Quinn Ave, or Quinn Rd? 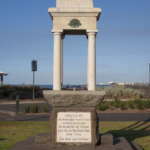 As was the custom of the time, many streets in Port Melbourne were named after prominent citizens, including mayors and councillors. 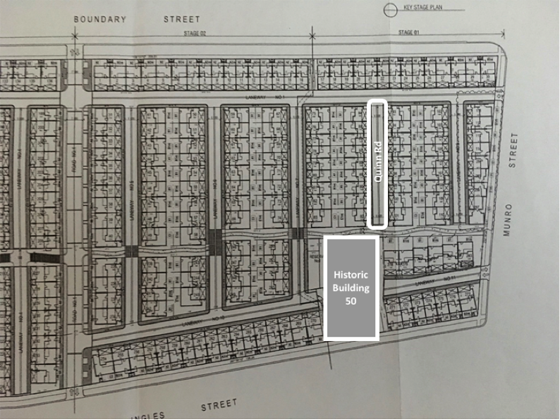 In this tradition you will discover a small roadway, Quinn Road, tucked away in a new housing development, 164 Ingles Street, at the northern boundary of the borough. Other names of roadways amongst this cluster of townhouses include; Velvet, Candle, Sunlight, Jago, and Kitchen Roads, plus Lever Street and Workers Street. These names all reflect the former use of the land bounded by Ingles, Munro, Boundary and Woodruff as the site of the manufacturing facility of John Kitchen & Sons, candle makers, and their successors. The former administrative building (building 50), renovated as part of the reality television show The Block,can be seen on the left of this photograph. Michael Quinn was born in County Clare, Ireland and immigrated to Melbourne in the 1850s. He was a well-known publican and his name remains prominent at the corner of Bay Street and Spring Street East on the parapet of the former Quinn’s Hotel (Council Club Hotel) which he built in 1874 and operated until his death. Quinn was a JP and served as a councillor from 1877-1886, including a stint as mayor of Sandridge in 1879-80. He was re-elected to council in 1888 but passed away in office in 1898. It turns out that Quinn Road is but the most recent manifestation of a roadway in Port named after this former publican and mayor spanning parts of three centuries. 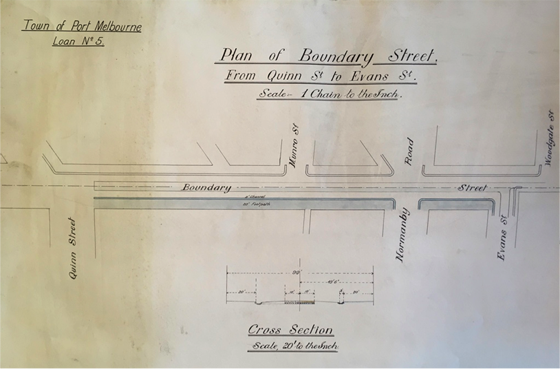 In 1891 Port Melbourne Council proposed changing Esplanade East to Quinn Street. However the residents resisted; they presented a petition and the change did not take place. A second attempt to change Esplanade East to Quinn Street occurred in 1895, along with a proposal to change the name of the northern section of Esplanade West to Lyons Street. While the latter proposal succeeded, again the good citizens of Esplanade East rallied, raised another petition and thwarted the proposed name change. Cr Quinn gracefully accepted the decision as part of a light hearted ‘debate’ in the council chambers. Locals had some fun at Cr Quinn’s expense in the Electric Sparks column in the local paper; a sort of twitter feed of its day with brief, often sarcastic, but anonymous, contributions from readers. The residents of Esplanade East object to living under Cr Quinn’s perpetual benediction. In fact if the Esplanade is called Quinn Street, they will all go and drown themselves in the lagoon, when it is dredged out. This was not exactly the wording of the petition, but is the deduction that was drawn from the petition. What’s in a name? One wag suggested a change to Queen’s Avenue would suit all parties. In 1898 the Council made a third attempt to change the name of Esplanade East, this time to Hill St., but this too proved unsuccessful. Cr Quinn led the charge against this change. Nevertheless a Quinn Street was proposed between Boundary and Ingles, near the location of the present day Quinn Road. Its location can be seen on this Council plan from 1893. However, based on the MMBW maps of 1895, it seems this “Quinn Street” became Kitchen Street. Around 1924, building 50 at Kitchen & Sons was constructed with a road on its southern side running between Boundary and Ingles which corresponds to the alignment of a narrow, unnamed “government road” in the 1895 MMBW map. This street also shows up in the Collins and Morgan’s street directories of the 1930s as Quinn Street. Thus, the location of 20thcentury Quinn Street may have been different to that proposed in the late 19th. 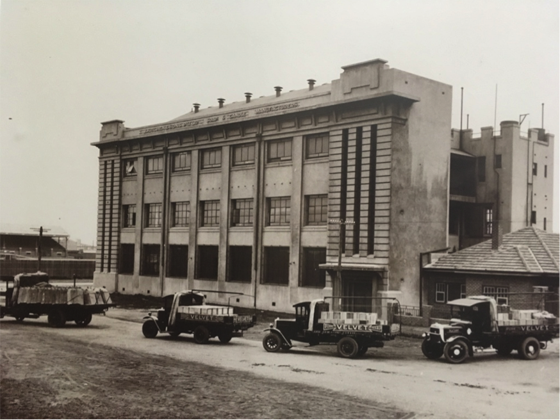 A photograph from 1929 shows trucks driving out of Kitchen’s along Quinn Street into Ingles Street, past the Administration Building, with the Port Melbourne Cricket Ground and Football Club in the background. It seems there was only ever one occupant of Quinn Street, an E.W. Weston, who was there from 1931 to 1940, probably living in the gatehouse. Quinn Street was closed permanently in 1940 to accommodate the expansion of operations at J Kitchen and Sons. The Lands Department demanded a payment of £2,130 to compensate for the loss which would go to consolidated revenue. 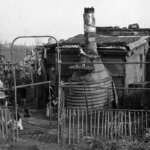 The Council’s solicitors said this was unreasonable and the matter was left in the hands of the Engineer and the Town Clerk for adjustment. An amiable adjustment was reached. Which brings us back to the new Quinn Road. During the planning phase of 164 Ingles St, the internal streets in the development had the non-descript labels of “laneway 1”, “laneway 2” etc. 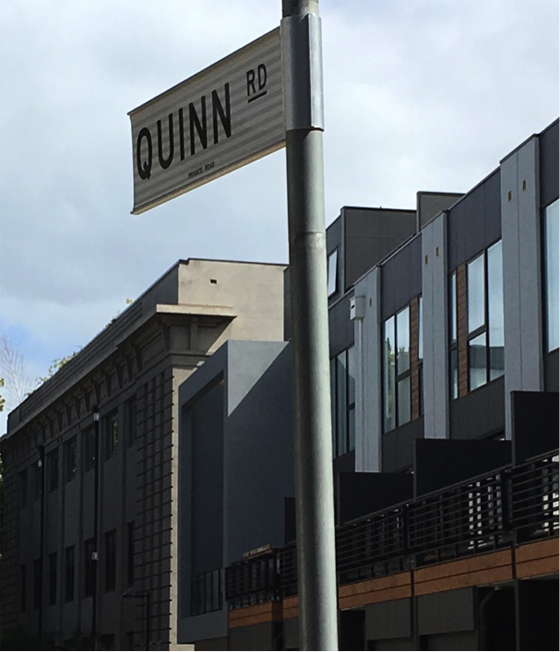 In late 2015 the PMH&PS petitioned the developers to rename one of these laneways after Quinn. So in a nod to history, “laneway 8” became Quinn Road. Or should it be Quinn Street or Quinn Avenue. What’s in a name?